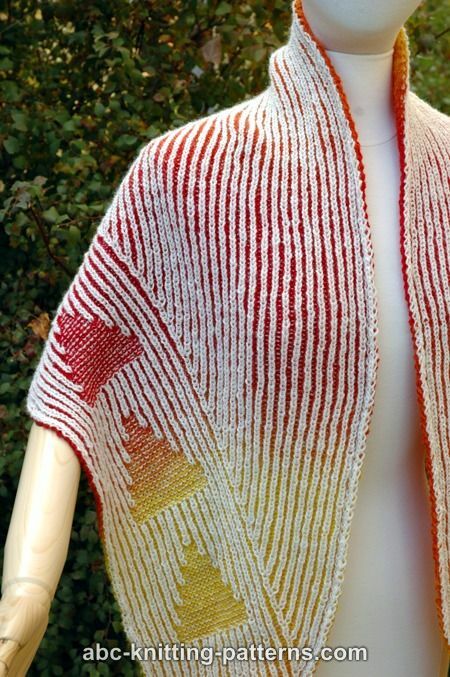 Brioche is used for the main body, while the garter stitch creates the motif along the edge of the shawl. 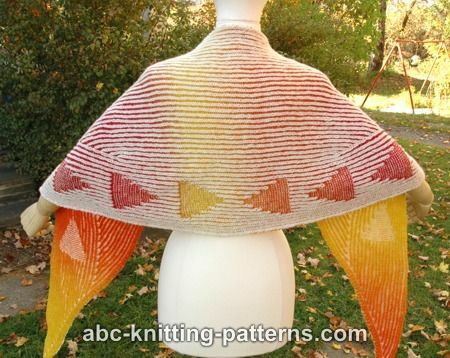 The shawl is worked sideways, with the increases made first on the right edge of the shawl (on RS) and then between the border with triangle areas and the body of the shawl. 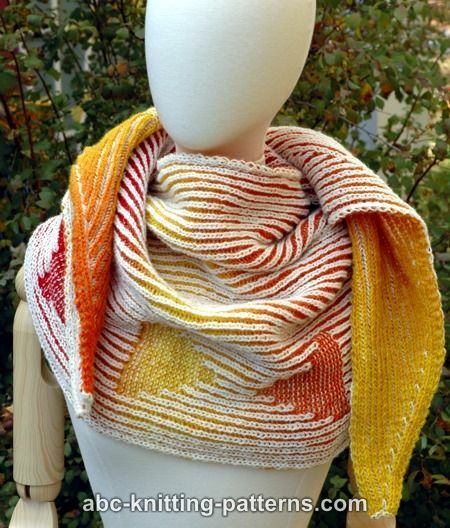 I used a solid light color yarn and a self-striping yarn with long color changes for the 2nd color. 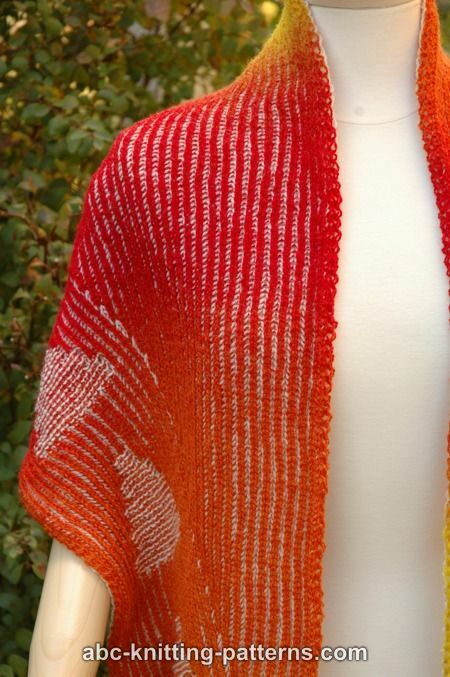 However, you can use any combination of yarn colors (self-striping, hand-dyed, solid) for different visual effects. 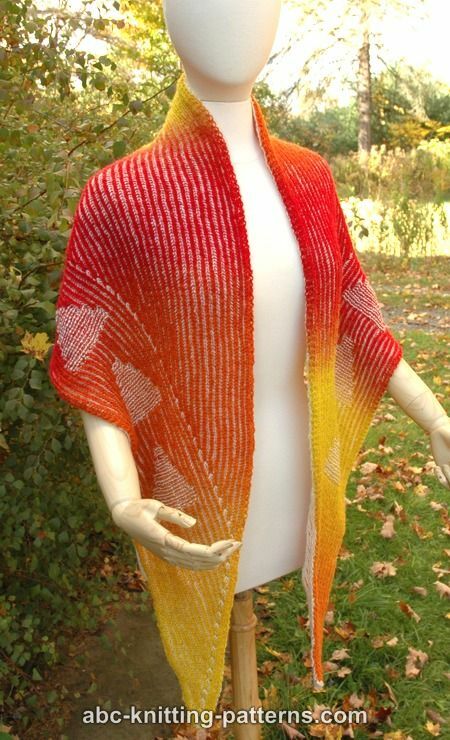 Due to the thickness of brioche stitch, this is quite a substantial shawl, nice for cooler weather. You could almost wear it like a scarf! 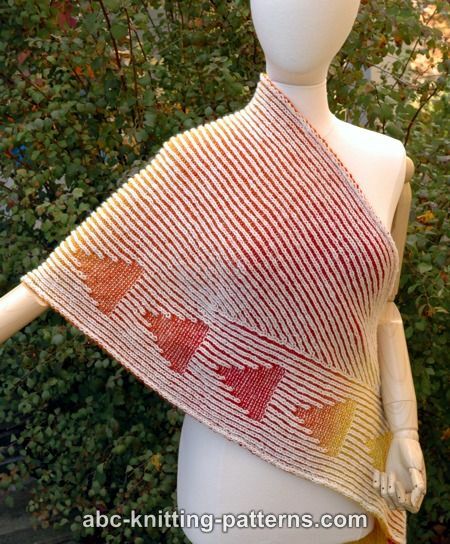 Materials: Kauni 8/2 Effektgarn 100% Wool sport weight yarn 440 yd (400 m)/100g, color Flame – 1.5 skeins. 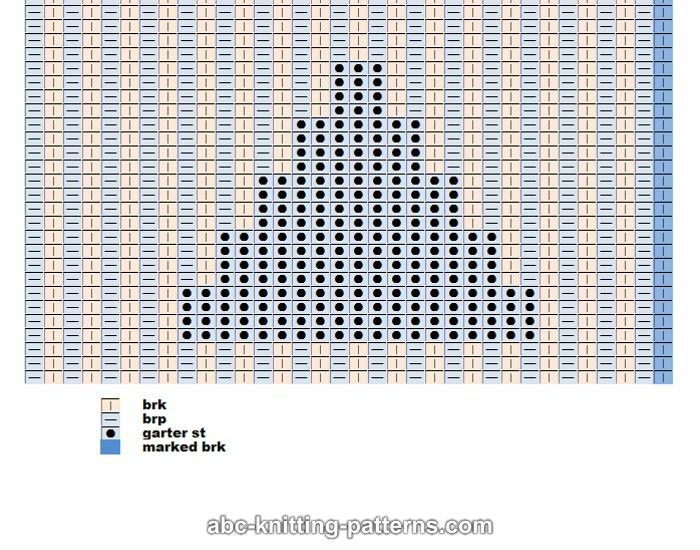 brk2tog (right slant 2-stitch decrease) – work to 2 sts before the marked st (last brk) , slip 2 sts knitwise (st with yarn over and single st) and knit (brk) them together. Return this st to the left needle and pass the marked st (st with yarn over) over. Move this st to the right needle. 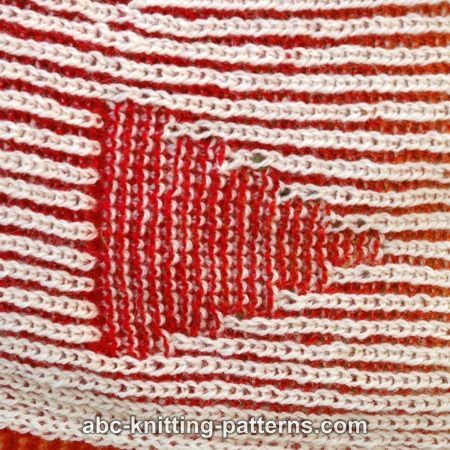 Consists of 4 sts at the beginning of the row and 4 stitches at the end of the row. Row 1 (LS LC): Beginning of the row: bring LC under DC, k 1, yf, sl 1, k 1, yf, sl 1. End of the row: yf, sl1, k 1, yf, sl 1, k 1. Do not turn, slide work to the other end of the needle. Row 1 (LS DC): Beginning of the row: sl 1, yf, p 1, yb, sl 1, yf, p 1. End of the row: p 1, yb, sl1, yf, p 1, yb, sl1. Turn. Row 2 (DS LC): Beginning of the row: bring LC under DC on DS, p 1, yb, sl 1, yf, p 1, yb, sl 1. End of the row: yb, sl 1, yf, p 1, yb, sl 1, yf, p 1. Do not turn, slide work to the other end of the needle. Row 2 (DS DC): Beginning of the row: sl 1, yb, k 1, yf, sl 1, yb, k 1. End of the row: k 1, yf, sl 1, yb, k 1, yf, sl 1. Turn. 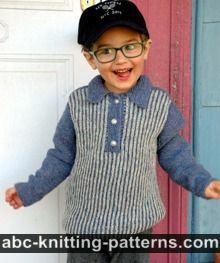 Please note that since the garter stripes are worked alongside the brioche stripes, each row is worked in both LC and DC, similar to the brioche. Both colors are worked in one direction, then the work is turned and both colors are worked in the other direction. 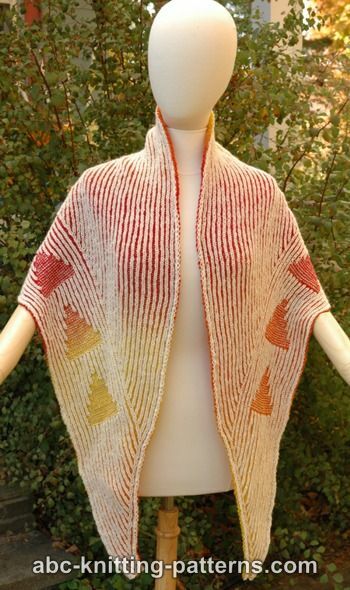 Row 1 (LS LC): purl. Do not turn, slide work to the other end of the needle. Row 1 (LS DC): knit. Turn. 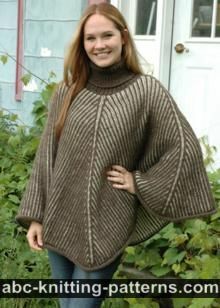 Row 2 (DS LC): knit. Do not turn, slide work to the other end of the needle. Row 2 (DS DC): purl. Turn. 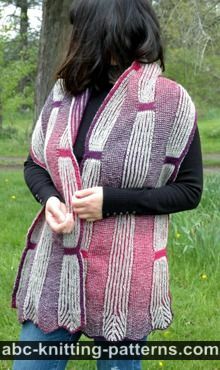 The shawl is worked sideways in two-color brioche stitch border with two-color garter stitch decorative areas shaped like triangles. 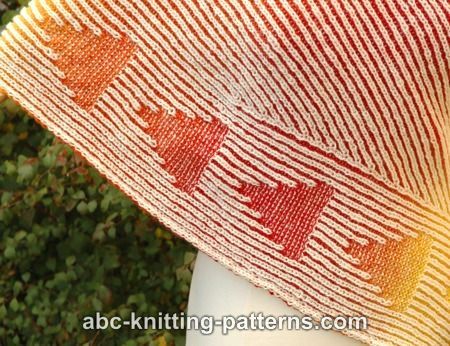 The increases are made first on the right edge of the shawl (on RS) and then between the border (which features the triangles) and the body of the shawl. With LC cast on 11 st.
Set-up row (LC): p 1, yb, sl 1, yf, p 1, yb, sl 1, sl1yof, p 1, sl1yof, yb, sl 1, yf, p 1, yb, sl 1, yf, p 1. Do not turn, slide work to the other end of the needle. Set-up row (DC): sl 1, yb, k 1, yf, sl 1, yb, k 1, brk 1, yfsl1yo, brk 1, k 1, yf, sl 1, yb, k 1, yf, sl 1. Turn. Row 1 (LS, LC): bring LC under DC, k 1, yf, sl 1, k 1, yf, sl 1, yfsl1yo, brkyobrk, yfsl1yo, yf, sl1, k 1, yf, sl 1, k 1. Do not turn, slide work to the other end of the needle. Row 1 (LS, DC): sl 1, yf, p 1, yb, sl 1, yf, p 1, brp 1, sl1yof, p 1, sl1yof, brp 1, p 1, yb, sl1, yf, p 1, yb, sl1. Turn. Row 2 (DS, LC): bring LC under DC on DS, p 1, yb, sl 1, yf, p 1, yb, sl 1, sl1yof, brp, sl1yof, brp, sl1yof, yb, sl 1, yf, p 1, yb, sl 1, yf, p 1. Do not turn, slide work to the other end of the needle. Row 2 (DS, DC): sl 1, yb, k 1, yf, sl 1, yb, k 1, brk, yfsl1yo, brk, yfsl1yo, brk, k 1, yf, sl 1, yb, k 1, yf, sl 1. Turn. Row 3: (LS, LC): bring LC under DC, k 1, yf, sl 1, k 1, yf, sl 1, yfsl1yo, brk, yfsl1yo, brk, yfsl1yo, yf, sl1, k 1, yf, sl 1, k 1. Do not turn, slide work to the other end of the needle. Row 3 (LS, DC): sl 1, yf, p 1, yb, sl 1, yf, p 1, brp, sl1yof, brp, sl1yof, brp, p 1, yb, sl1, yf, p 1, yb, sl1. Turn. Row 4 (DS, LC): bring LC under DC on DS, p 1, yb, sl 1, yf, p 1, yb, sl 1, sl1yof, brp, sl1yof, brp, sl1yof, yb, sl 1, yf, p 1, yb, sl 1, yf, p 1. Do not turn, slide work to the other end of the needle. Row 4 (DS, DC): sl 1, yb, k 1, yf, sl 1, yb, k 1, brk, yfsl1yo, brk, yfsl1yo, brk, k 1, yf, sl 1, yb, k 1, yf, sl 1. Turn. Row 5 (LS, LC): bring LC under DC, k 1, yf, sl 1, k 1, yf, sl 1, yfsl1yo, brkyobrk, yfsl1yo, brk, yfsl1yo, yf, sl1, k 1, yf, sl 1, k 1. Do not turn, slide work to the other end of the needle. Row 5 (LS DC): sl 1, yf, p 1, yb, sl 1, yf, p 1, brp, sl1yof, p 1, sl1yof, brp, sl1yof, brp, p 1, yb, sl1, yf, p 1, yb, sl1. Turn. Row 6 (DS LC): bring LC under DC on DS, p 1, yb, sl 1, yf, p 1, yb, sl 1, sl1yof, (brp, sl1yof) 3 times, yb, sl 1, yf, p 1, yb, sl 1, yf, p 1. Do not turn, slide work to the other end of the needle. Row 6 (DS DC): sl 1, yb, k 1, yf, sl 1, yb, k 1, brk, (yfsl1yo, brk) 3 times, k 1, yf, sl 1, yb, k 1, yf, sl 1. Turn. Row 7 (LS LC): bring LC under DC, k 1, yf, sl 1, k 1, yf, sl 1, yfsl1yo, (brk, yfsl1yo) 3 times, yf, sl1, k 1, yf, sl 1, k 1. Do not turn, slide work to the other end of the needle. Row 7 (LS DC): sl 1, yf, p 1, yb, sl 1, yf, p 1, brp, (sl1yof, brp 1) 3 times, p 1, yb, sl1, yf, p 1, yb, sl1. Turn. Row 8 (DS LC): bring LC under DC on DS, p 1, yb, sl 1, yf, p 1, yb, sl 1, sl1yof, (brp, sl1yof) 3 times, yb, sl 1, yf, p 1, yb, sl 1, yf, p 1. Do not turn, slide work to the other end of the needle. Row 8 (DS DC): sl 1, yb, k 1, yf, sl 1, yb, k 1, brk, (yfsl1yo, brk) 3 times, k 1, yf, sl 1, yb, k 1, yf, sl 1. Turn. Row 9 (LS, LC): bring LC under DC, k 1, yf, sl 1, k 1, yf, sl 1, yfsl1yo, brkyobrk, yfsl1yo, (brk, yfsl1yo) repeat to last 4 sts, yf, sl1, k 1, yf, sl 1, k 1. Do not turn, slide work to the other end of the needle. Row 9 (LS DC): sl 1, yf, p 1, yb, sl 1, yf, p 1, brp, sl1yof, p 1, sl1yof, brp, (sl1yof, brp) repeat to last 4 sts, p 1, yb, sl1, yf, p 1, yb, sl1. Turn. Row 10 (DS LC): bring LC under DC on DS, p 1, yb, sl 1, yf, p 1, yb, sl 1, sl1yof, (brp, sl1yof) repeat to last 4 sts, yb, sl 1, yf, p 1, yb, sl 1, yf, p 1. Do not turn, slide work to the other end of the needle. Row 10 (DS DC): sl 1, yb, k 1, yf, sl 1, yb, k 1, brk, (yfsl1yo, brk) repeat to last 4 sts, k 1, yf, sl 1, yb, k 1, yf, sl 1. Turn. Row 11 (LS LC): bring LC under DC, k 1, yf, sl 1, k 1, yf, sl 1, yfsl1yo, (brk, yfsl1yo) repeat to last 4 sts, yf, sl1, k 1, yf, sl 1, k 1. Do not turn, slide work to the other end of the needle. Row 11 (LS DC): sl 1, yf, p 1, yb, sl 1, yf, p 1, brp, (sl1yof, brp 1) repeat to last 4 sts, p 1, yb, sl1, yf, p 1, yb, sl1. Turn. Row 12 (DS LC): bring LC under DC on DS, p 1, yb, sl 1, yf, p 1, yb, sl 1, sl1yof, (brp, sl1yof) repeat to last 4 sts, yb, sl 1, yf, p 1, yb, sl 1, yf, p 1. Do not turn, slide work to the other end of the needle. Row 12 (DS DC): sl 1, yb, k 1, yf, sl 1, yb, k 1, brk, (yfsl1yo, brk) repeat to last 4 sts, k 1, yf, sl 1, yb, k 1, yf, sl 1. Turn. Rows 13-68: repeat rows 9-12. On LC place a marker on the 17th brk from the end of the row (at this point it is the 2nd brk from the beginning of the row). Now you are going to make brkyobrk increases at this stitch. All the increased stitches will now be to the right of this st.
Row 69 (LS, LC): bring LC under DC, k 1, yf, sl 1, k 1, yf, sl 1, yfsl1yo, brk, yfsl1yo, brkyobrk (at marked st), yfsl1yo, (brk, yfsl1yo) repeat to last 4 sts, yf, sl1, k 1, yf, sl 1, k 1. Do not turn, slide work to the other end of the needle. Row 69 (LS DC): sl 1, yf, p 1, yb, sl 1, yf, p 1, brp, sl1yof, brp, sl1yof, p 1, sl1yof, brp, (sl1yof, brp) repeat to last 4 sts, p 1, yb, sl1, yf, p 1, yb, sl1. Turn. Row 70 (DS LC): bring LC under DC on DS, p 1, yb, sl 1, yf, p 1, yb, sl 1, sl1yof, (brp, sl1yof) repeat to last 4 sts, yb, sl 1, yf, p 1, yb, sl 1, yf, p 1. Do not turn, slide work to the other end of the needle. Row 70 (DS DC): sl 1, yb, k 1, yf, sl 1, yb, k 1, brk, (yfsl1yo, brk) repeat to last 4 sts, k 1, yf, sl 1, yb, k 1, yf, sl 1. Turn. Row 71 (LS LC): bring LC under DC, k 1, yf, sl 1, k 1, yf, sl 1, yfsl1yo, (brk, yfsl1yo) repeat to last 4 sts, yf, sl1, k 1, yf, sl 1, k 1. Do not turn, slide work to the other end of the needle. Row 71 (LS DC): sl 1, yf, p 1, yb, sl 1, yf, p 1, brp, (sl1yof, brp 1) repeat to last 4 sts, p 1, yb, sl1, yf, p 1, yb, sl1. Turn. Row 72 (DS LC): bring LC under DC on DS, p 1, yb, sl 1, yf, p 1, yb, sl 1, sl1yof, (brp, sl1yof) repeat to last 4 sts, yb, sl 1, yf, p 1, yb, sl 1, yf, p 1. Do not turn, slide work to the other end of the needle. Row 72 (DS DC): sl 1, yb, k 1, yf, sl 1, yb, k 1, brk, (yfsl1yo, brk) repeat to last 4 sts, k 1, yf, sl 1, yb, k 1, yf, sl 1. Turn. Row 73 (LS, LC): bring LC under DC, k 1, yf, sl 1, k 1, yf, sl 1, yfsl1yo, (brk, yfsl1yo) repeat to marked st, brkyobrk (at marked st), yfsl1yo, (brk, yfsl1yo) repeat to last 4 sts, yf, sl1, k 1, yf, sl 1, k 1. Do not turn, slide work to the other end of the needle. Row 73 (LS DC): sl 1, yf, p 1, yb, sl 1, yf, p 1, brp, (sl1yof, brp) repeat to marked st, sl1yof, p 1, sl1yof, brp, (sl1yof, brp) repeat to last 4 sts, p 1, yb, sl1, yf, p 1, yb, sl1. Turn. Row 74 (DS LC): bring LC under DC on DS, p 1, yb, sl 1, yf, p 1, yb, sl 1, sl1yof, (brp, sl1yof) repeat to last 4 sts, yb, sl 1, yf, p 1, yb, sl 1, yf, p 1. Do not turn, slide work to the other end of the needle. Row 74 (DS DC): sl 1, yb, k 1, yf, sl 1, yb, k 1, brk, (yfsl1yo, brk) repeat to last 4 sts, k 1, yf, sl 1, yb, k 1, yf, sl 1. Turn. Row 75 (LS LC): bring LC under DC, k 1, yf, sl 1, k 1, yf, sl 1, yfsl1yo, (brk, yfsl1yo) repeat to last 4 sts, yf, sl1, k 1, yf, sl 1, k 1. Do not turn, slide work to the other end of the needle. Row 75 (LS DC): sl 1, yf, p 1, yb, sl 1, yf, p 1, brp, (sl1yof, brp 1) repeat to last 4 sts, p 1, yb, sl1, yf, p 1, yb, sl1. Turn. Row 76 (DS LC): bring LC under DC on DS, p 1, yb, sl 1, yf, p 1, yb, sl 1, sl1yof, (brp, sl1yof) repeat to last 4 sts, yb, sl 1, yf, p 1, yb, sl 1, yf, p 1. Do not turn, slide work to the other end of the needle. Row 76 (DS DC): sl 1, yb, k 1, yf, sl 1, yb, k 1, brk, (yfsl1yo, brk) repeat to last 4 sts, k 1, yf, sl 1, yb, k 1, yf, sl 1. Turn. Rows 77-180: repeat rows 73-76. 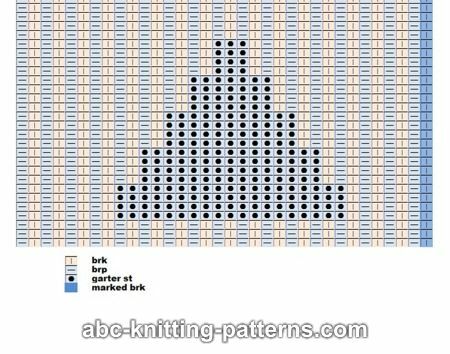 Starting from row 81, work garter stitch triangle following the chart. 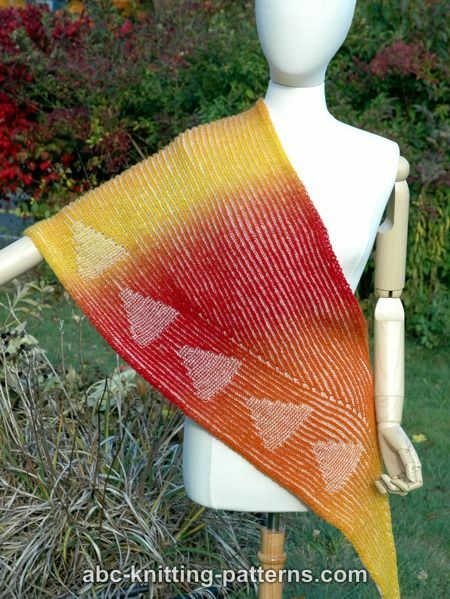 Each triangle is 20 rows. There are 12 rows between triangles. Work 5 triangles following chart 1 and 5 triangles following chart 2. Row 81 (LS, LC): bring LC under DC, k 1, yf, sl 1, k 1, yf, sl 1, yfsl1yo, (brk, yfsl1yo) repeat to marked st, brkyobrk (at marked st), (yfsl1yo, brk) 3 times, p 19, (brk, yfsl1yo) repeat to last 4 sts, yf, sl1, k 1, yf, sl 1, k 1. Do not turn, slide work to the other end of the needle. Row 81 (LS DC): sl 1, yf, p 1, yb, sl 1, yf, p 1, brp, (sl1yof, brp) repeat to marked st, sl1yof, p 1, sl1yof, (brp, sl1yof) 3 times, k 19, (sl1yof, brp) repeat to last 4 sts, p 1, yb, sl1, yf, p 1, yb, sl1. Turn. Row 82 (DS LC): bring LC under DC on DS, p 1, yb, sl 1, yf, p 1, yb, sl 1, (sl1yof, brp) 4 times, k 19, (brp, sl1yof) repeat to last 4 sts, yb, sl 1, yf, p 1, yb, sl 1, yf, p 1. Do not turn, slide work to the other end of the needle. Row 82 (DS DC): sl 1, yb, k 1, yf, sl 1, yb, k 1, (brk, yfsl1yo) 4 times, p 19, (yfsl1yo, brk) repeat to last 4 sts, k 1, yf, sl 1, yb, k 1, yf, sl 1. Turn. Row 85 (LS, LC): bring LC under DC, k 1, yf, sl 1, k 1, yf, sl 1, yfsl1yo, (brk, yfsl1yo) repeat to marked st, brkyobrk (at marked st), (yfsl1yo, brk) 4 times, p 15, (brk, yfsl1yo) repeat to last 4 sts, yf, sl1, k 1, yf, sl 1, k 1. Do not turn, slide work to the other end of the needle. Row 85 (LS DC): sl 1, yf, p 1, yb, sl 1, yf, p 1, brp, (sl1yof, brp) repeat to marked st, sl1yof, p 1, sl1yof, (brp, sl1yof) 4 times, k 15, (sl1yof, brp) repeat to last 4 sts, p 1, yb, sl1, yf, p 1, yb, sl1. Turn. Row 86 (DS LC): bring LC under DC on DS, p 1, yb, sl 1, yf, p 1, yb, sl 1, (sl1yof, brp) 5 times, k 15, (brp, sl1yof) repeat to last 4 sts, yb, sl 1, yf, p 1, yb, sl 1, yf, p 1. Do not turn, slide work to the other end of the needle. Row 86 (DS DC): sl 1, yb, k 1, yf, sl 1, yb, k 1, (brk, yfsl1yo) 5 times, p 15, (yfsl1yo, brk) repeat to last 4 sts, k 1, yf, sl 1, yb, k 1, yf, sl 1. Turn. Rows 81-82 and 85-86 are the 1-2 and 5-6 rows of the chart. Work the rest of the chart as established. Rows 181-296: repeat rows 75-76 (no increases). From row 297 begin decreases: at marked st work brk2tog (right slant 2-stitch decrease) every 4 rows, total 28 times (rows 297-408). From row 409 work brsssk (left slant 2-stitch decrease) at 1st brk at the beginning of the row every 4 rows, 17 times (rows 409-476). Work 2 more brioche rows and bind off.